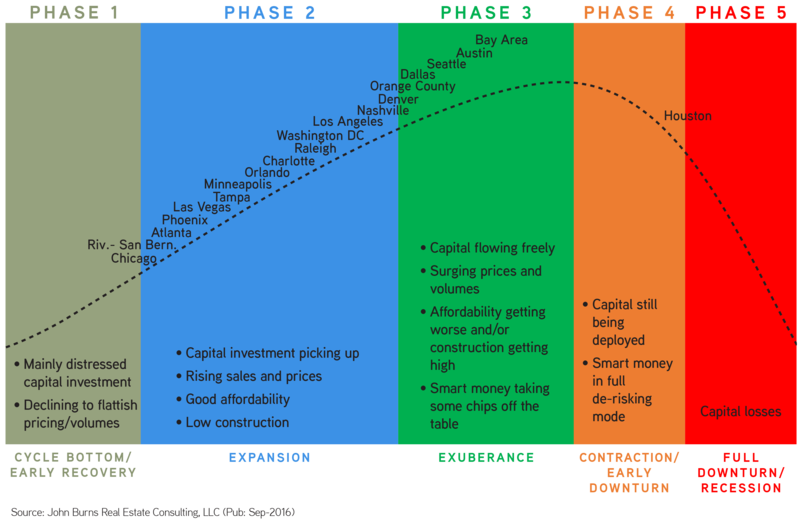 Where are we in the housing cycle? This, by far, is the question we get asked the most. It’s often framed with the metaphor of a nine-inning baseball game: What inning are we in? This question implies that markets move in unison, driven by similar factors. In reality, every market has its own unique set of industry influences, supply impediments (or lack thereof), and demographic drivers. While some markets took it on the chin during the last cycle, many others were left relatively unscathed. To better answer the cycle question, we examined all of these influences across the 20 largest new home volume markets. I break down our findings below. Declining to flattish home price and sales trends remain the norm, and investors can still find distressed opportunities. Only Chicago remains in the Early Recovery phase. Home values there are 23% below prior peak, and new home sales lag a whopping 85% below prior peak. Chicago’s economy continues to underperform, hampered by underperforming sectors such as manufacturing, financial services, and government. Lastly, budget and pension problems increase the likelihood of tax increases down the road—a risk many local builders/developers/homebuyers aren’t interested in taking. Capital investment picks up in the Expansion phase, accompanied by rising home values and sales trends. Affordability is good, and construction activity has reached healthy levels. Many of our clients today are laser-focused on these geographies, continuously adding to their investments in these markets. Job growth has come back nicely, with the lion’s share of Expansion markets recovering all of the jobs lost during the Great Recession. 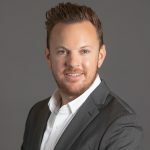 Prices have yet to rebound massively, with home values roughly 20%–30% below prior peak in markets such as Las Vegas, Riverside-San Bernardino, Phoenix, Orlando, and Tampa. Investment risk also remains fairly muted. Our Housing Cycle Risk Index™ (measuring demand/supply/affordability within each market) indicates low to very low risk levels in all Phase 2 markets except Denver, Nashville, and Orange County. All three markets have nearly reached the Exuberance phase. Capital has flowed freely for several years now in these markets. Prices and sales volumes have surged, and smart money is now investing more cautiously. Austin, Dallas, the Bay Area, and Seattle all fit this description. It’s important to note that Texas markets never shot up to the extent that Phase 1 and Phase 2 markets did during the mid-2000s. Home values in both Austin and Dallas barely budged during the Great Recession, falling a modest 3%. Since then, prices have been on a tear, rising almost 50%. Job growth has also been phenomenal, with Dallas and Austin now possessing roughly 20% and 30% more jobs than during their prior peaks. Higher-paying jobs in tech, health care, and construction have driven this increase. Other Phase 3 markets, such as the Bay Area and Seattle, didn’t quite experience the run-up that other markets did during the subprime heyday. Rather, their economies were still recovering from the dot-com bust, with job losses stretching from 2001–2004. Tech has since entered a renaissance: surging job growth, booming construction activity, and sky-high home prices have become the norm in these markets. Along with a possible tech slowdown, our biggest concern in all Phase 3 markets is lack of affordability. Already we are beginning to see signs that look eerily familiar to prior boom/bust cycles. Builders in more affordable spillover markets such as Sacramento note a surge in transplants. Bay Area buyers are cashing out or are simply priced out of buying close to where they work. Only Houston has entered the Contraction phase. Oil’s move from $100+/barrel to just $45 has resulted in job growth falling from 100,000 jobs per year to less than 10,000. Construction activity has pulled back, particularly in apartments. Higher price point homes have felt the brunt of the downturn, while lower price points have held up remarkably well. We believe Houston will remain in Phase 4 through 2017 and will most likely avoid the full-fledged downturn/recession associated with Phase 5. Capital losses are the norm and are typically unavoidable at this point in the cycle. At the moment, none of the major new home markets are in recession. Our job is to help our clients decide when and where to place their investment chips throughout the cycle. We do this by objectively assessing risk/return profiles in housing markets throughout the country. We believe that the vast majority of markets remain in the Expansion phase. Plenty of innings are left to be played this recovery in these markets. There are a handful of markets that appear long in the tooth based on our market-specific definition of the housing cycle. In baseball terms, we’re pretty close to the 7th-inning stretch in Austin, Dallas, the Bay Area, and Seattle. These four markets are currently some of the strongest and most profitable markets in the country for our clients—and could very well remain so for quite some time, especially if rates stay low and tech avoids a major correction.